“I can be anything I want to be,” said a focus group participant in a heavy tone. This woman, most recently a CFO, went on to say, “it is freeing and confusing because I can be anything I want to be.” All in attendance politely laughed – revealing their own discomfort with this common divide. She was no stranger to transition. Early in her career she had resigned from a tenured professorship in The Classics to take a role in finance. Her remark made we wonder, is identity the holy grail of transition? Identity or in my transition’s parlance creating a ‘highly personal, self-created identity’ serves as a fundamental core to the work of transition. It’s simple. Isn’t it? What do I want to do? Have you ever asked yourself that question and struggled with the answer? I remember being cowed by it early on. Immediately after I left Iron Mountain eager friends inquired of me, ‘so what do you want to do?’ While I had some vague notions I couldn’t honestly answer the question. I’d say something like, ‘I’m consulting.’ I was doing projects so the answer wasn’t dishonest. But it was puffery. At least it was a response. Inside I was despondent. Of all the elements of transition it took me the longest to get my arms around this one. How do you re-frame identity? This week I stumbled onto some historically significant perspectives on women’s identity. A book caught my eye as I was running through the lobby of our local library en route to a program with my daughter. There perched on a display celebrating its 50th anniversary of publication was Betty Friedan’s The Feminine Mystique. When I saw it I quickly reasoned that any self-respecting advocate for women’s development needed to read it. So much for their beautiful display….. The book shares Friedan’s conclusions from research she conducted in the 50’s and 60’s that revealed widespread unhappiness among women. In the book she argued that women’s unhappiness was caused by and large from their lack of identity outside of roles determined by biology or anatomy. She was also hyper critical of the media. The feminine mystique, in her mind, was a false notion created largely by the media that women could be fulfilled simply (or only) through roles like housewife or mother. The media – it seems – espoused that fulfillment could be gained via ownership of canary yellow consumer durables and other hollow concepts. a) Inventory that which you find joyful: It doesn’t matter if you are 22 or 52. The very first step is to list the things that have really truly made you happy. What’s captivated your attention and your heart? A game? A job? A moment? An achievement? No one else’s list will look like yours – so skip the comparisons. b) Work the list: Can your list be ranked? Can you talk out loud about it to anyone? Book group? Work colleague? Old friend? New acquaintance? Can you extend the ideas? Maybe use a trick contained in my favorite ‘what if’ tool, Harvard Business School’s personal elevator pitch builder. It asks you to answer the who, what, why and goal for yourself. It took me the better part of a year to understand how much I needed to work the list. Ideas on a page weren’t enough. Exploring them was the real start. c) Test & Re-test: Investigate the ideas that have grown out of A & B. The objective is to validate or invalidate an idea before you make a huge commitment to it. There are loads of ways to do this…a Skype networking call, reading a series of articles, listening to a TED talk. It can be done one night a week for months or over the course of a few short days. The only rules? Eliminate ‘bet the farm’ type commitments. Break it down into parts. Learn from processing each step. Integrate what you learn and then, re-test. Even today two gates challenge my forward progress with this cycle. Both are trumpeted from a megaphone inside my head. One sounds something like, ‘I could never to that.’ The other? A rigid filter of what constitutes viable work. Have you ever encountered either of these? The focus group participant who offered her pithy and powerful question on identity was clear on her transition’s trigger: boredom. 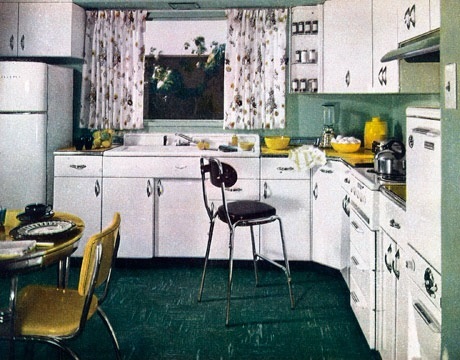 My guess is that you’ll have the courage to look beyond the canary yellow accoutrements for your kitchen. The real question? Can you step beyond the fear, uncertainty, guilt, and yes, maybe even boredom, to really define an identity that is solely yours? Only you know if you have the courage to take that first step…. This entry was posted in Observations on Transition and tagged Betty Friedan, The Feminine Mystique, transition, women's transition. Bookmark the permalink.